I’ve long been fascinated by Louisa May Alcott, who showed me that an ordinary-enough girl could grow up to be a writer. Even before I’d read Little Women, I played with my sister and friends at being Meg, Jo, Beth, or Amy, one of the sisters in the novel published in 1868, which has never gone out of print. I liked the idea of dipping a pen into ink while eating apples in a garret, but my older sister claimed the role of Jo, the writer. I didn’t entirely mind being Amy. Even before I’d studied point of view, I had a sense that it might only be an older sister’s opinion that the youngest was frivolous. Besides, what was so wrong with a fondness for good food, pretty clothes, handsome men, and happiness? I continued to wonder about different definitions of selfishness after I grew up and learned about the four real sisters behind the ones in Little Women. Amy March was portrayed as a dilettante who gave up artistic aspirations when she married a rich young man. 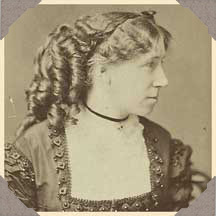 In real life, May Alcott attended art school and professional classes. A book of her drawings of noted places in Concord was published shortly after her sister’s novel. She’d go on to study in a Paris atelier and have paintings displayed in that city’s Salon, which attracted tens of thousands of art-lovers each spring. May and Louisa had plenty of years to bond as the two single women in their family, yet Louisa never seemed to take May’s aspirations seriously. Louisa’s portrait of Amy March opened a door to the more complicated May Alcott. I wrote Little Women in Blue: A Novel of May Alcott to show how May wanted and believed she could have both a career as an artist and a satisfying family life. I explored why Louisa, imaginative and forward thinking as she was, struggled to see that women might claim what some men took for granted. In this year of May’s 175th birthday, I’m happy to show what she accomplished and at what cost. Read a Conversation with Jeannine talking about writing Little Woman in Blue. Learn more about the Alcotts through this Reading List and Places to Visit. 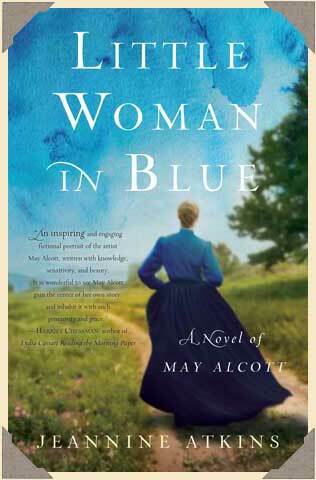 Learn more about May Alcott and other special women in my books on Pinterest .